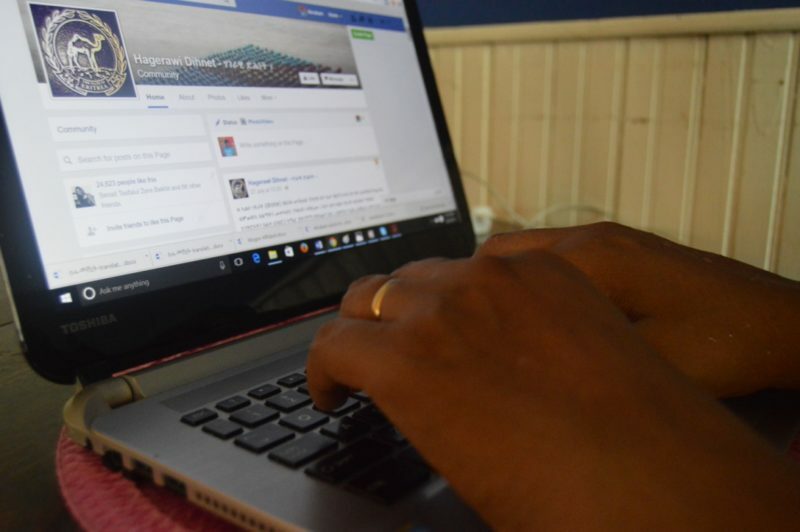 Eritrean diaspora on social media. Photo by Yonatan Tewelde, used with permission. A few months ago an Eritrean acquaintance called me to discuss an article he wanted to write for PEN Eritrea’s website. He had worked as a journalist in Eritrea, where we’re both from, before fleeing the country nearly ten years ago. 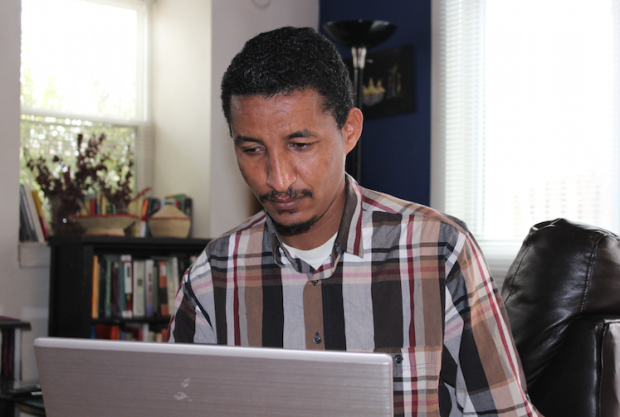 He had recently spoken out (under a pen name) about his former colleagues who were languishing incommunicado in detention centers in Eritrea, a story that was then covered by various media including The Guardian, in partnership with our organization.Click here to read the whole article from Global Voices. In early 2016, journalists and staff members who held key positions in Eritrea’s ministry of information were required to fill out a detailed personal form, including information on their bank accounts, and where their family lived. The threat to those thinking of leaving the country was clear. It has been more than 10 years since I stopped working for the ministry of information. In that period, it has evolved into a centre of terror, more militarised than ever and more overtly interfering in journalists’ lives. Click here to read the original article from The Independent. In just two months, SACTISM – Classified Documents of the Dwindling PFDJ has garnered more than 16,000 followers on the social media site by alleging to have new information about human rights violations committed at the hands of president Isaias Afewerki’s ruling party, the People’s Front for Democracy and Justice. Click here to read the article from The Guardian. Extremely student-friendly professors compared with the neo-feudal system I experienced back home. Tons of reading materials. “Never ask to challenge students, but test how much they know” philosophy. An obsession about weather. Exceedingly programmed lifestyle where you take half an hour to figure out a 10-minute coffee meeting. New terms and concepts like hookup, one-night stand, three-somes (disclaimer: I am married and never tried any of those, and my wife will also read the article, anyways). An extreme capitalist culture that trickles down to individual levels and entered the linguistic register where a friend offers to “buy coffee,” instead of other terms such as invite, accompany or join. Unlearning old habits such as avoiding conversations with a person next to you in a bar or a coffee-shop, but have your iPhone to check Facebook, text or take selfies (my compliment to a young woman sitting next to me could also be interpreted as “sexual harassment,” lesson learned). The humiliating experience of splitting bills in restaurants where invitation to dinner or lunch does not necessarily mean the person will take care of the bill, but asking you to accompany him/her (sharing is caring as the great Barney says it, right?). Learning to converse at length about pets with strangers in the street (the only way of talking to random people). Abandoning the metric system and start to count in feet, pounds and Fahrenheit (Google is a savior). A system that honors individual liberty (“mind your own business,” how I love it!). Exceptionally friendly assistants/secretaries in most administrative offices (I had terrible experiences with their counterparts back home where they literally bully customers).Click here to read the whole article from The Athens News. This text provides an overview of the Eritrean media, particularly as it relates to the local music industry. After Eritrea’s independence in 1991, music continued to be used for political reasons – but this time, by Eritrea’s government against its own people. Various bands worked directly under the party’s organs and the army, producing a disproportionate number of songs for the many national holidays that fill up the Eritrean calendar. Only songs produced in this fashion received substantial media airplay. This tradition has resulted in an “echo chamber” in which Eritrean artists produce music that they know the state-controlled media want – despite the songs’ obvious lack of quality, integrity or creativity. Singers are rewarded according to how well their songs are received in the state media and how much airtime they receive. This sort of “success” opens further opportunities for these artists to tour outside the country. While the state media heavily promotes music that fulfills their own agenda, this does not necessarily improve the quality of productions. With the almost constant playing of patriotic songs on national radio and TV, it’s difficult to gauge how the music is really being received. The public’s continuous exposure to mediocre music results in a limited ability to discern what good-quality music actually is. There’s little or no objective standard for quality music in Eritrea – no knowledgeable music critics, very little musical scholarship and little access to decent, freely-made music from outside the country.Click here to read the whole article from Music in Africa. When they start working, state journalists are immediately forced to master the unwritten laws of the Ministry of Information. This trend is self-perpetuating, cultivating a reliably obedient body that ensures continuity. The Ministry hires journalists mainly from the army or from the pool of high-school graduates who have not attended college. College graduates who have gone through journalistic training are immediately forced to compromise their professional integrity or are coerced into “unlearning” ethical and journalistic standards in order to survive. News reporting is centralized with little or no autonomy. The national news agency, ERINA, produces what passes as national news, and translates international news from cherry-picked media outlets. Without any adjustment of wording for different media outlets, the exact same news simultaneously appears in all official organs of print and broadcast media on the same day, even when communicated in different languages. Even the least important local news is sifted through tight filters. Ali Abdu, who served as Minister of Information for about 10 years before he fled the regime in 2012 (after successfully institutionalizing thought control and fear), at one point was approving every news item before it was published. Click here to read the whole article from PEN International. A native of Eritrea, a small country in the Horn of Africa, I have lived about four years in United States. One of the constant reminders of being away from home is the complete shift in sports language and (un)learning new games. The first shock is using “football” to refer to what I have called all my life “American football.” As a form of bold defiance, I insist on calling it “American football” and am still resisting the use of “soccer” to refer to football. Eritrea has become one of the world’s worst offenders for human rights abuses over the last decade, imprisoning the third highest number journalists – after China and Iran. Those writers who remain face stringent censorship in a media climate characterised by the monotonous recycling of official information put out by a paranoid government. In response to these conditions, Eritrean journalists in exile set up PEN Eritrea, an organisation to connect this inaccessible country and the outside world, and to campaign on behalf of the country’s imprisoned journalists, many of whom have been jailed for more than a decade without contact with their families. Click here to read the article from The Guardian.